As I write this post, I have sweat dripping down the back of my neck. I know that's not the most hunger-inducing way to start a post on a food blog, but seriously, it's hot in Minneapolis. Like, really hot. In classic Minnesota style, the weather abruptly changed from the cool, damp 50º F range to a sweltering 95º F with 55% humidity, all in about one week. And in fact, right now it is a whopping 101º F! And it will only get more humid from here, and soon, we'll all be sweating the minute we get out of the shower. It is a pretty intense shock to the body to undergo these kind of rapid changes, but that is the reality of living here. We experience a range of about 120º throughout the year, from bone chilling, paralyzing subzero temperatures to heat and humidity so intense that you feel like you are walking through pea soup. Either it's too cold and too dry, or too hot and too humid, and you hear conversation about it everywhere and anywhere you go! Oh, but those few golden, perfect, glorious days we have in the brief window between the unbearably cold and the unbearably hot make all of it worth it (okay, okay, almost worth it). We're a tough breed here in Minnesota. That said, this morning when I woke to my bedroom feeling like a steam room, I had to remind myself out loud that somehow, this heat is still better than feeling like a popsicle. I put on a somewhat work-inappropriate black minidress (dress codes in weather like this lose all meaning to me) and went downstairs to make breakfast. I had absolutely no interest in fried eggs or a bowl of oatmeal. I hardly wanted to eat I was so hot! So, a smoothie seemed appropriate. Searching the freezer and refrigerator, I came up with a smoothie inspired by the foods of early summer in Minnesota, with a tropical twist: fresh rhubarb, fresh strawberries, frozen mango, organic yogurt, hemp oil, and hemp seeds. 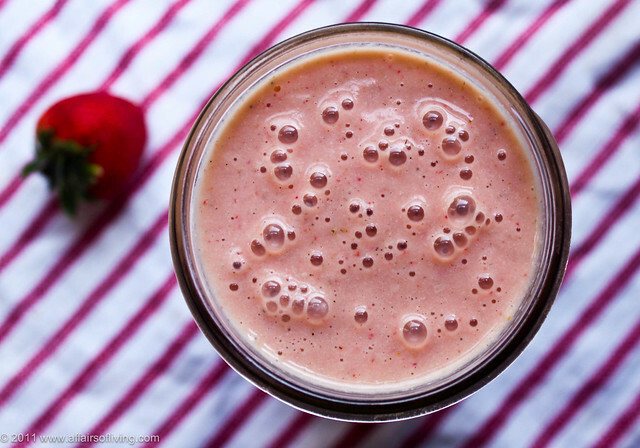 Creamy, sweet, tart, and most importantly, cold, this smoothie totally rocked my world. It's kind of like a Minnesota-version of a mango lassi! 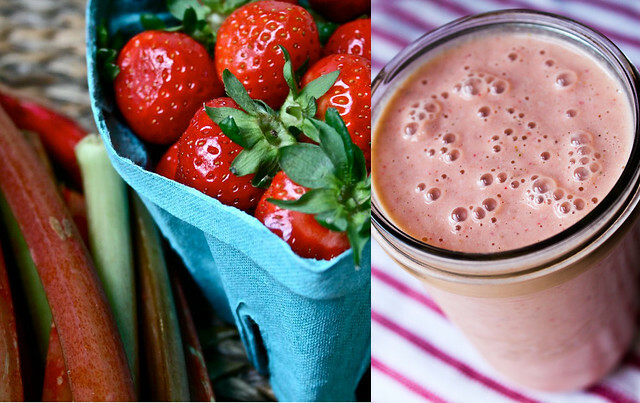 I know adding raw rhubarb to a smoothie sounds goofy, but you'll like it. Go with the flow. I used organic yogurt in this smoothie for a blast of probiotic bacteria, a boost of protein and a creamy, rich texture. If you live dairy-free, you still have lots of options for a creamy twist. Feel free to substitute yogurt with a non-dairy yogurt (or non-dairy kefir), of your choosing, such as store-bought varieties of soy, rice, or coconut milk yogurt or kefir (make sure to look at ingredients, most have added sugars or other additives). You could substitute homemade cashew-coconut yogurt (try this recipe, it is great), homemade nut or seed creams (soaked nuts/seeds blended with water), or full fat coconut milk. For a different direction entirely, add 1/2-3/4 cup sliced banana (either room temperature or frozen) in place of yogurt - it won't have the protein content, but it will be creamy, add body to your smoothie, and amp up the "tropical" flavor. Place all ingredients in a blender and add about 1/2 cup water. Blend on high until smooth, adding more water as necessary to reach desired consistency. Serve immediately, or refrigerate in a well-sealed jar or bottle for up to 24 hours before serving.